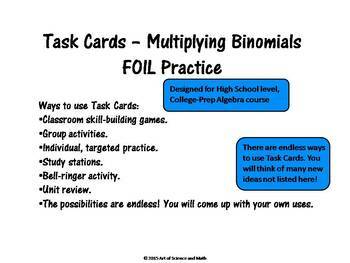 Use these task cards to reinforce the skills of multiplying binomials using FOIL in your high school math course. 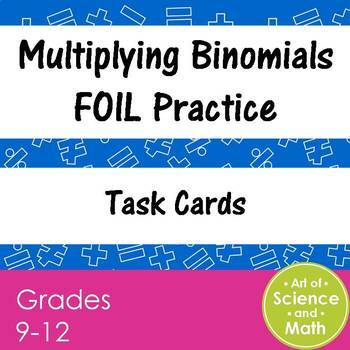 Used as a bell-ringer, quiz, study station, review, students will be practicing multiplying binomials using FOIL. · The possibilities are endless! You will come up with your own uses. 1. 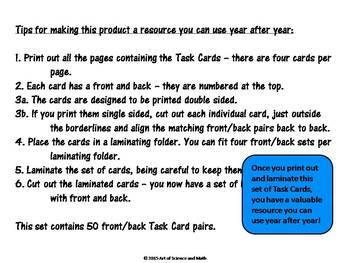 Print out all the pages containing the Task Cards – there are four cards per page. 2. Each card has a front and back – they are numbered at the top. 3a. The cards are designed to be printed double sided. 3b. If you print them single sided, cut out each individual card, just outside the borderlines and align the matching front/back pairs back to back. 4. Place the cards in a laminating folder. You can fit four front/back sets per laminating folder. 5. Laminate the set of cards, being careful to keep them aligned. 6. 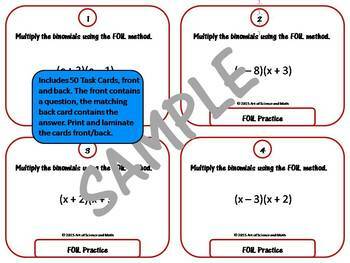 Cut out the laminated cards – you now have a set of laminated Task Cards, with front and back.